Altus Air Force Base (Altus AFB, AAFB) (IATA: LTS, ICAO: KLTS, FAA LID: LTS) is a United States Air Force base located approximately 4 miles (6.4 km) east-northeast of Altus, Oklahoma. The host unit at Altus AFB is the 97th Air Mobility Wing (97 AMW), assigned to the Nineteenth Air Force (19 AF) of the Air Education and Training Command (AETC). The wing's mission is to provide C-17 Globemaster III, KC-135 Stratotanker and KC-46 Pegasus formal initial and advanced specialty training programs for up to 3,000 flight crew and aircraft maintenance students annually. 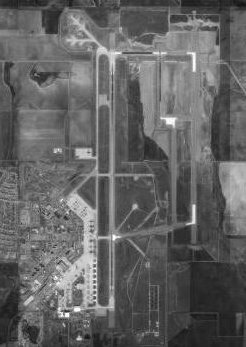 Altus AFB was established in 1943 as Altus Army Airfield (AAF). The 97 AMW commander is Colonel Eric Carney. The Command Chief Master Sergeant is Chief Master Sergeant Randy Kay II. Plans and executes C-17 and KC-135 formal school, initial and advanced specialty training programs for up to 3000 students annually. Sustains Boeing C-17 Globemaster III, Boeing KC-135 Stratotanker and Boeing KC-46 Pegasus airland, airdrop and air refueling mobility forces, providing global reach for combat and contingency operations. Provides air traffic control and weather forecasting for flying operations. Provides mission, infrastructure, and community quality of life support for personnel and all assigned organizations on Altus AFB. Supports worldwide USAF taskings with deployment ready personnel and equipment. Provides maintenance and support to all assigned aircraft and provides the same maintenance support to transient aircraft, engines and associated ground equipment. To provide backshop support to all three aircraft while continuously improving environmental awareness and effectively managing maintenance resources, allowing the 97th Air Mobility Wing to perform its aircrew training mission. Ensures maximum wartime readiness and combat capability by promoting the health, safety and morale of active duty personnel. Staffs, trains, mobilizes and provides medical services in support of contingency operations worldwide. Develops and operates a prevention-oriented, cost-effective managed healthcare system for over 9,500 people. Between 1945 and 1953, Altus AFB served as a scrap yard for hundreds of World War II era military aircraft. In 1945 the famous B-17F "Memphis Belle" was discovered at Altus awaiting disposal. The aircraft was saved and transferred to the city of Memphis, Tennessee, where it was displayed until 2005, when it was relocated to the National Museum of the United States Air Force at Wright-Patterson AFB in Ohio. The base sat idle for only a few years. The onset of the Korean War in June 1950 created the need for more men to fly and service aircraft. During the early years of the conflict, many World War II airfields were examined for reactivation. On 1 August 1953, Altus Air Force Base was reactivated as a training base for transport aircraft. The C-47 "Skytrain" and the C-45 "Expediter" were the main aircraft assigned to the base, run briefly by the 63d Troop Carrier Wing from 8 January until 15 October 1953 under the watch of the Tactical Air Command (TAC). During the 1950s, the base underwent many changes and changed hands from TAC to the Strategic Air Command (SAC). Later that year, on 18 November, the 96th Bombardment Wing, Medium (96 BMW) arrived and began operations with three bomber squadrons and one air refueling squadron. The squadrons eventually flew the first all jet-engined bomber, the B-47 Stratojet and the KC-97 Stratofreighter, a dual-purpose cargo and air-refueling aircraft. By the end of the decade, both of these aircraft would be replaced by aircraft still in the Air Force inventory, the KC-135 Stratotanker and the B-52 Stratofortress. The KC-135 was the first all jet-engined air-refueling aircraft and the B-52 still remains the backbone of the USAF bomber fleet. When the 96th BW moved to Dyess AFB, Texas, the 11th Bombardment Wing (Heavy) activated and stood on alert during the Cold War. June 1961 witnessed the activation of twelve Atlas “F” intercontinental ballistic missile sites within a 40-mile radius of the base. Controlled by the 577th Strategic Missile Squadron, the missiles sat inside a silo, constructed underground with a launch facility, and manned around the clock. The missile silos became operational on 10 October 1962, but the activation would be short-lived. By April 1965, the Atlas missile was outdated and was phased out of the national strategic defense plan. In August 1966, the 4th Mobile Communications Group transferred from Hunter AFB, Georgia to Altus. The unit's mission consisted of providing mobile and transportable communication services, aiding navigation and air traffic control throughout the world. In 1967, the Air Force began searching for a base that could handle the training for its strategic airlift fleet, the C-141 Starlifter and its newest and largest transport aircraft, the C-5 Galaxy. Again, Oklahoma proved to be well suited for the mission. The Military Airlift Command (MAC) assumed command of the base from SAC and activated the 443d Military Airlift Wing (443 MAW), Training, to assume host wing responsibilities and to fly alongside the SAC aircraft that would become a tenant command at Altus. By the start of the 1970s, Altus AFB had three aircraft type/models assigned: KC-135s, C-141s, and C-5s. For the KC-135 aircraft at Altus still under SAC's control, the USAF activated the 340th Air Refueling Wing, which continued to operate the base's KC-135s. The post Cold War environment brought many changes to Altus AFB. On 1 June 1992, the Air Force reorganized and the Military Airlift Command (MAC) disestablished. In its place the new Air Mobility Command (AMC) was activated, which placed MAC's strategic and tactical airlift aircraft and SAC's aerial refueling aircraft under a single command. Second, the 443d Airlift Wing and the 340th Air Refueling Wing were inactivated, with the latter's aircraft transferred to the 19th Air Refueling Wing (19 ARW) at Robins AFB, Georgia. On 1 October, the first Air Mobility Wing (AMW), the 97th Air Mobility Wing (97 AMW), arrived at Altus without personnel or equipment, having formerly been designated as SAC's 97th Bombardment Wing and having been transferred from the deactivating Eaker AFB, Arkansas as a result of Base Realignment and Closure (BRAC) action. The 97 AMW was tasked with flight crew formal training unit (FTU) responsibilities for the C-141 and C-5 aircrew, and with the closure of Castle AFB, California due to BRAC action, concurrently assumed FTU responsibilities for KC-135E/R/T flight crews. On 1 July 1993, the 97th was transferred from AMC to the newly established Air Education and Training Command (AETC) as part of a USAF initiative to move most FTU activities to AETC. More changes were on the horizon. In 1996, the latest addition to Altus AFB, the new C-17 Globemaster III, arrived. Even before its arrival, the base began training pilots and loadmasters to operate and fly the aircraft. In August 2002, the mission of the wing grew when the Air Force moved the basic loadmaster course from Sheppard AFB, Texas to Altus. This initiative combined similar training programs to reduce the number of moves required by trainees while cutting overall costs. Additionally, during that same month, the wing reorganized as a "combat wing": the 97th Support Group became the 97th Mission Support Group, gaining the new 97th Logistics Readiness Squadron (comprising the former 97th Supply Squadron, 97th Transportation Squadron and logistics plans flight) and the 97th Contracting Squadron. Also, the 97th Logistics Group inactivated and the 97th Maintenance Directorate was activated. The directorate comprises civil-service personnel, who are responsible for the care and maintenance of all three airframes at the base. The 97 AMW discontinued FTU responsibilities for the C-141 concurrent with that aircraft's retirement from the USAF inventory in 2006. On 1 July 2007, the Air Force Reserve Command's (AFRC) 433d Airlift Wing (433 AW) at Lackland AFB/Kelly Field (former Kelly AFB) assumed responsibility for all flying training and academic training for the C-5 aircraft for all Regular Air Force, Air Force Reserve Command (AFRC) and Air National Guard (ANG) aircrews, leaving the 97 AMW and Altus to concentrate on C-17 and KC-135 training for AMC, USAFE, PACAF, AFRC and ANG aircrews. The 577th Strategic Missile Squadron operated twelve missile sites, of one missile at each site. ^ FAA Airport Master Record for LTS (Form 5010 PDF), effective 2009-07-02. This article incorporates public domain material from the United States Government document "Altus Air Force Base".